The 1st EPA Forum took place on Saturday, 28 March 2015 in Vienna, Austria. At the Forum, 108 participants centred their discussion around a common theme: Improving Mental Health and Mental Health Care across Europe. 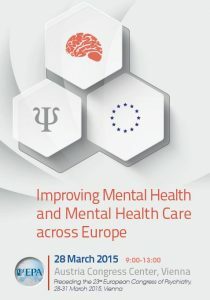 Speakers from the WHO, UN, and the EU, as well as European psychiatric organisations such as EUFAMI, GAMIAN, and ROAMER, joined EPA leaders for lectures, roundtable discussions and breakout sessions included in the Forum programme.